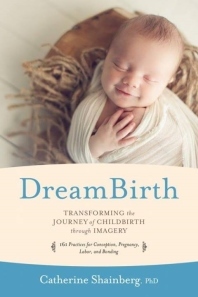 There is no greater tool for pregnancy and childbirth than DreamBirth® Imagery. Catherine Shainberg, the creator of DreamBirth®, explains that Imagery is the first language of the body: “The body doesn’t understand words as well as it does pictures. You can’t tell your heart to beat less quickly, but with imagery you can learn to quiet the heart beat, lower high blood pressure or stop premature contractions”. The work is experiential, consisting of quick one- to three-minute exercises that are easy to learn, simple and enjoyable to do. No matter what your previous experience with pregnancy and birth, you can better your experience using this simple, powerful method. If you are a birth professional, you will learn how to use this powerful method to help your clients have the birth of their dreams. The training comprises eight weekly 90 minute classes. The training comprises 20 weekly 90 minute classes, arranged in five Modules. Modules must be taken sequentially, but can be at will. If you have not yet succeeded in conceiving, or if you are someone who wants to conceive consciously, DreamBirth® Conception can help you. Almost 100% of the women who used DreamBirth® to conceive have been successful, even if other methods had failed them. In this training you will learn to use imagery—quick one- to three-minute exercises that are easy to learn, simple and enjoyable to do—to affect your body, your emotions, your mind and your spirit. You will hear conception success stories and practice DreamBirth® for yourself, in this experiential work. You will learn about the importance of night dreams and the role of the subconscious mind in conception, and how with DreamBirth® you can harness the strength and knowledge that resides there, and clear and transform all obstacles to conceiving. If you are a birth professional, you will learn how to empower your clients with this powerful method. The training comprises 12 weekly 90 minute classes, arranged in three Modules. "I can unequivocally assert that there is no greater tool for both pregnancy and childbirth than DreamBirth®. It is also an incredible tool for conception: 95% of the women I worked with have conceived. Many of these women came to me in desperation, still unable to conceive after having multiple IVF’s. DreamBirth® is a beautiful adjunct to any other modality that is being used for conception; it will enhance the effects of acupuncture, herbs, and IVF."